How to Pinterest for Travel & Tourism? Ask Dream.Pin.Go. How to Pinterest? Pinterest is a tool that lets people collect, organise and share visual content (called ‘Pins’) that they discover around the internet through the Pinterest website and/or through applications designed for mobile devices. Organised by self-categorised ‘Pin Boards’, all images are visible to other users and can be shared or bookmarked with just a click. You can compare Pinterest with those cork pin boards or a fridge where you put on your to-do-lists, recipes, inspirational images or other snippets you find appealing in some way. To celebrate the launch of this website and to provide you with practical information right from the start, I’ve created a 10-part Pinterest tutorial that will help you get started on this popular visual platform. In this step-by-step Pinterest guide, I will give you a quick overview of the Pinterest platform: from its purpose and function to the benefit to your business. I will guide you through setting up your account and will give you advice on quick adjustments that will bring you more brand awareness and traffic to your website. Part 1: What is Pinterest for? Part 2: Who Created Pinterest? Part 3: How to Download Pinterest? Part 4: How to Sign up for Pinterest? Part 5: How to use Pinterest App? Part 6: What is a Pin? Part 7: What are Pinterest Boards? Part 8: How to Pin on Pinterest? Part 9: How to Pin a Photo on Pinterest? Part 10: How to Search for People on Pinterest? This 10-part tutorial is only the start of what Dream.Pin.Go. will bring you. 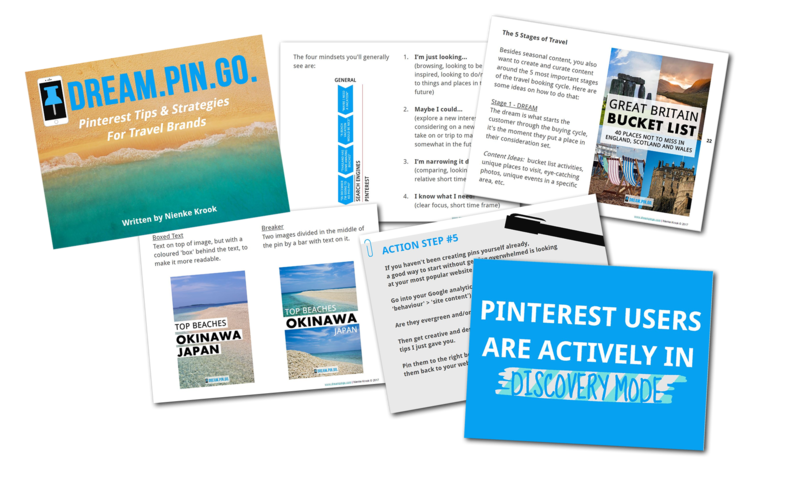 With weekly updates and a regular newsletter, I will make sure you’re staying up-to-date with the latest Pinterest news, as well as updates and case studies from the social media and tourism industry. On top of that, you will receive lots of practical tips to help you make a success out of your own Pinterest account as well. I’m also working on an online video course, so make sure to sign up for the newsletter to not miss your VIP access in June 2016. If you, or someone else in your company wondered ‘How to Pinterest?’, this is your chance to finally get started and understand what all the fuss is about. Posted in blog, pinterest marketing, pinterest tutorialBookmark the permalink.